So much has changed in the last 2 and a bit years, we welcomed a little person into our lives and seemed to put everything else on hold. There was always a reason not to do something just for us, not wanting to leave our little guy overnight in the worry that he may wake up and realise we were not there, or that he wouldn’t settle for Granny. For me it was always an issue that I didn’t want my Mum to have to get up for night feeds, I felt this was my job and I didn’t want to burden anyone else with it. It is only now, in recent months that I have felt comfortable leaving Leo. He sleeps through the night and loves to spend time at Granny’s house. It has given me the opportunity to head out on rare nights out and even contemplate a weekend break. 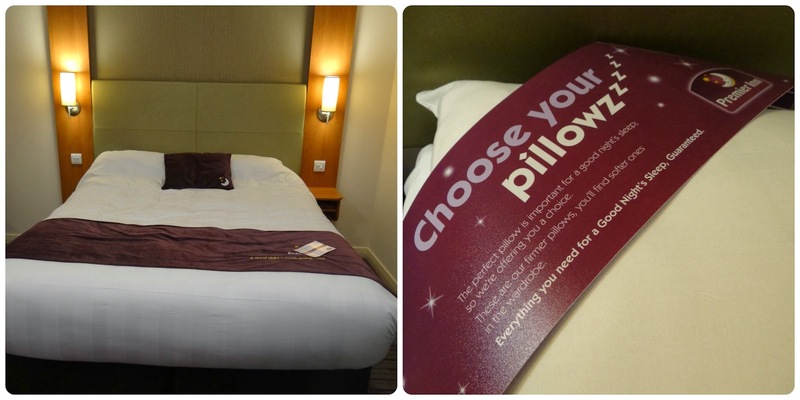 Luke and I were booked into the Monument Premier Inn on Saturday 25th January 2014 for a couples getaway. It was to be filled with sightseeing, good food and a guaranteed good night’s sleep. Of course when you have kids... plans have a mind of their own and can change at the very last minute, so what was to be a couples escape… became a family getaway. Suitcases, pushchair and Leo in tow we made our way to London. Leo was incredibly excited about the 2 hour train ride ahead of him and he spent the duarion contently staring out of the window. 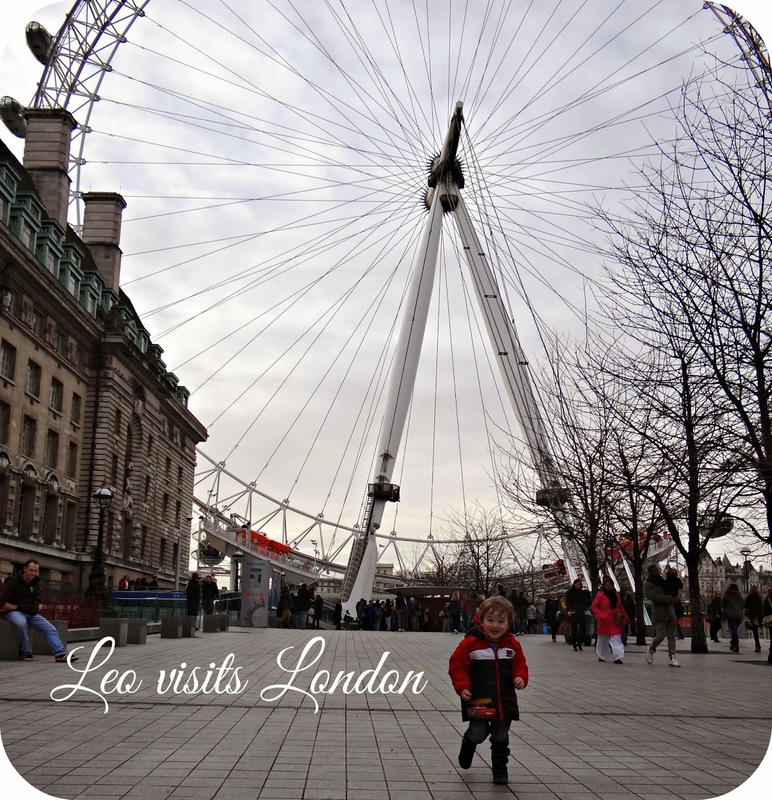 After arriving in London just before Midday we decided to ride the London Eye before making our way over to the hotel – The London Eye is a post for another day. We arrived at the Monument Premier Inn just after 5pm and we were greeted by the receptionist with a big smile and a warm welcome. She had us checked in within minutes and directed us up to our family room. I was instantly relaxed and I knew that we were in good hands. We were booked in for an early dinner at 5:30pm as Leo was completely exhausted from his day in London and I think we were all hopeful of an early night. 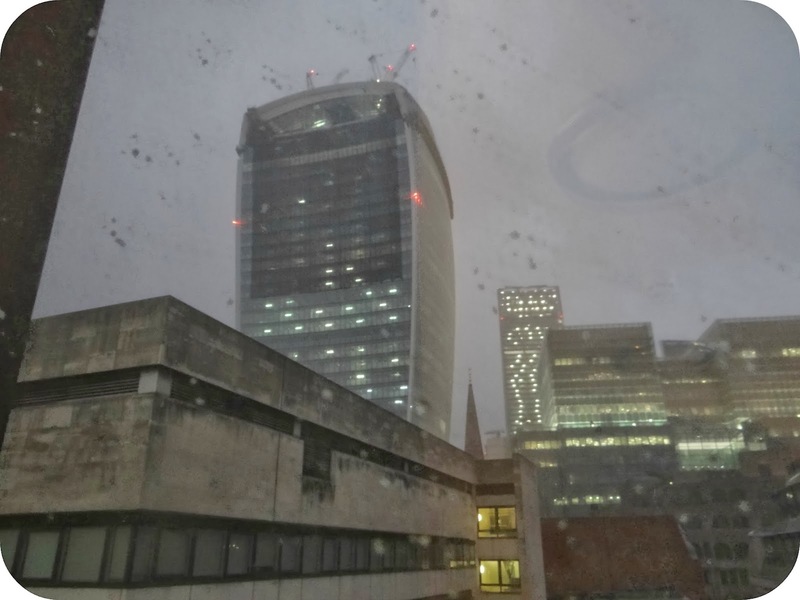 We were located on the 7th floor of the hotel which gave us grand views of London’s buildings, are room even looked out onto the walkie talkie building… You know that one otherwise known as the walkie schorchie after fried paint on car’s last summer thanks to the sun’s rays! The Monument have a lift that takes you right up to the 7th floor and also right down to the restaurant, this came in very useful with our bags and of course having Leo in a pushchair. We found it simple to wheel him into the lift and get all of us to our bedroom. 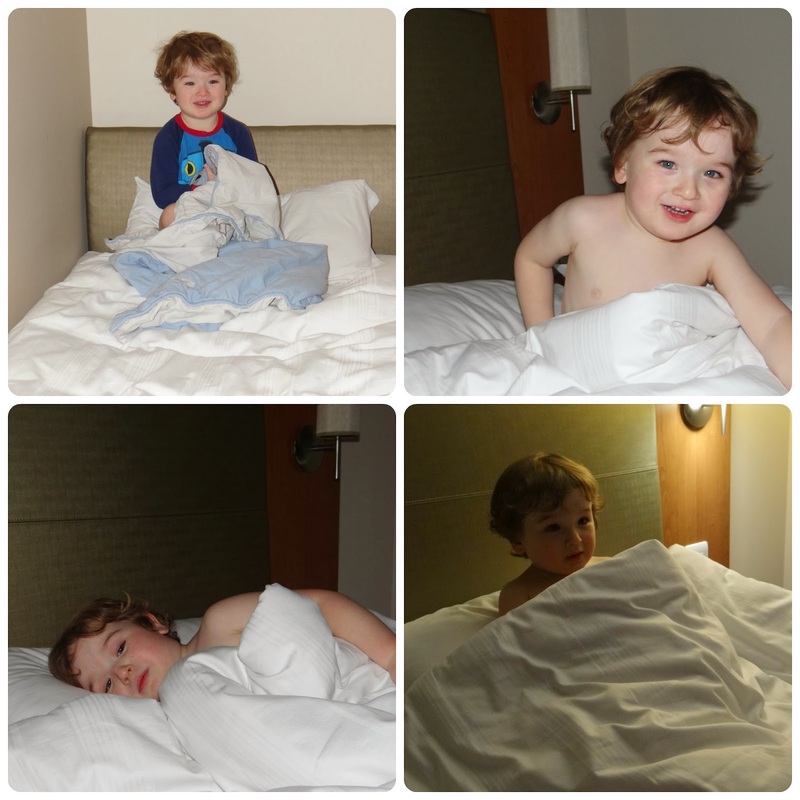 We had luckily been allocated a family room which even had a bed for Leo right by the side of the double bed. I had also requested a cot in the room as at the time I hadn't realised there would be a bed available for Leo, this gave him the choice on where he would prefer to sleep. The family room was a generous size, perfect for the 3 of us. One of the first things I noticed was just how clean everything was, this is always something that I notice straight away. The bedroom had everything we needed and the bathroom was spotless. Having never stayed at a Premier Inn before I was really pleased with the cleanliness, size and feel of the room. What I did notice was that there was no telephone, which in a way is nice as you know you won't be disturbed. But then I can see it from another point of view... If you need to ask reception a question you have no choice but to trapse back downstairs again. We didn't really miss it though as everything was communicated by written information left within the room. I couldn't fault reception at all when we did have any queries and they always smiled and said 'hello' when we passed. We spent the evening around the hotel and went down for a leisurely dinner at around 6pm. It was here that I was really impressed with just how assertive the staff were, and just how accommodating they were. Nothing was too much trouble, and as soon as we sat down with Leo they brought him some crayons and some colouring paper. This of course was very well received. 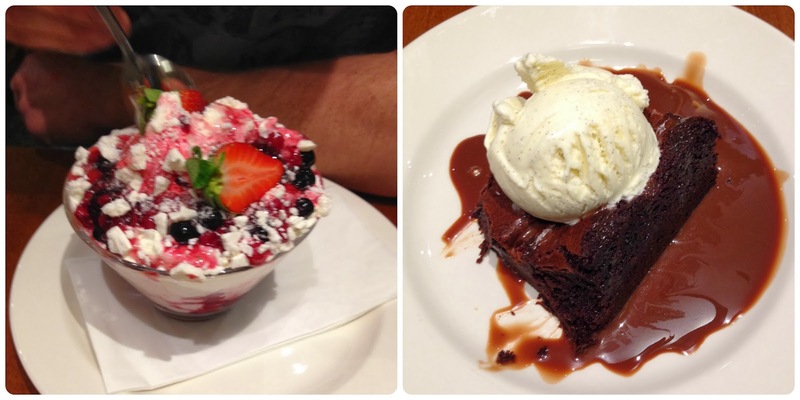 The food was fantastic and completely blew my expectations out of the water. It looked as good as it tasted and my steak meal was really tasty. We were served by Jesus and Layla, both lovely people who took the time to talk to us and of course make a fuss of Leo. Leo loved Layla so much that he was even blowing kisses at her by the end of the meal. After a really filling meal we all retired to our room, Leo was exhausted after his busy day exploring the capital and both Luke and I were too. Leo slept in the full size single bed that night and managed to topple out on numerous occasions, but he was adamant he wanted the bed over the travel cot. Our big double bed was perfectly comfy and we all awoke in time for a late breakfast, which actually went on until 11am on Sunday. Breakfast was served in the restaurant and it offered a great selection. Fruit, toast, yogurts and a full English Breakfast buffet. Leo tucked into ample amounts of Apple while Daddy and I devoured the all you can eat cooked breakfast. The breakfast really is worth getting up for. The rate for a room at Premier Inn is £116.00 per room per night and if you wish to include breakfast on the Premier Flex Rate it is £143.90. Our experience was truly worthy of the rates and being in such a central location makes this a great choice for a relaxing nights sleep when you have finished sight seeing. Thanks for having us Premier Inn. Disclaimer: We were provided with our room, dinner and breakfast free of charge in return for our honest views and opinions. 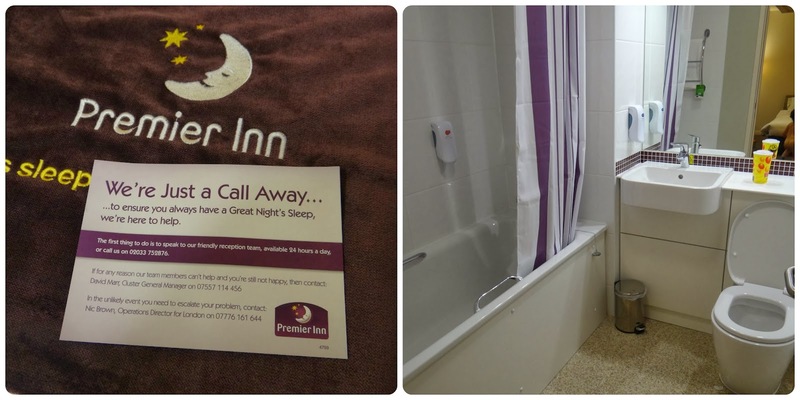 We genuinely had a great time and really enjoyed our experience with Premier Inn.